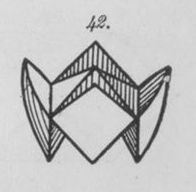 This page attempts to record what is known about the origin and history of the traditional design known as the Salt Cellar, or, more recently, as the Fortune Teller or Cootie Catcher (particularly in the USA), and the Pepperpot, which is made by folding the outside corners of the Salt Cellar inwards. The Salt Cellar has many other names as well, some of which, such as Chatterbox, reflect the use of the design as a talking puppet. Please contact me if you know any of this information is incorrect or if you have any other important information that should be added. Thank you. As far as I know these closely related designs first occur in the historical record, under their French names of La Saliere and La Poivrière in a list of paperfolds suitable for use in kindergartens, on the Froebelian model, in the book 'Manual Pratique des Jardins d'Enfants de Freidrich Froebel' edited by J-F Jacobs, which was published in Brussels and Paris in 1859. The Pepperpot (Het peper-en zoutvat) is illustrated in 'De Kleine Papierwerkers' by Elise Van Calcar which was published by K H Schadd in Amsterdam in 1863. As far as I can tell the Salt Cellar is not mentioned in this book. Diagrams for the Salt Cellar are included in 'Des Kindes Erste Beschaftigungsbuch' by E Barth and W Niederley, which was first published in Bielefeld and Leipzig, and the foreword of which is dated October 1876. 'The Kindergarten Principle' by Mary J Lyschinska, which was published in London in 1880 by Wm Isbister Ltd, contains mention of four designs, the Work Basket with Four Pockets (presumably the Salt Cellar), the Travelling Bag (presumably the Travel Bag), the Flower and Another Flower. Unfortunately no illustrations of these designs are provided. Both the Salt Cellar and the Pepperpot, which is titled the 'Cake Dish', appear in 'The Kindergarten Guide' by Maria Kraus Boelte and John Kraus, which was probably first published by E. Steiger and Company in New York in 1882. The Salt Cellar and the Pepperpot are both illustrated, though not named, in Eleonore Heerwart's 'Course in Paperfolding', which was first published in Dutch in 1895 then in English by Charles and Dible in London and Glasgow in 1896. Both design appear in Lois Bates' 'Kindergarten Guide', which was first published by Longmans, Green and Co in London in 1897 The Salt Cellar is called 'The Cruet' and the Pepperpot is called 'The Salt-cellar' in this book. The Salt Cellar appears as 'La Saliere' in 'Le Livre des Amusettes' by Toto, which was published in Paris by Charles Mendel in 1899. Both the Salt Cellar and the Pepperpot appear in 'Die Frobelschen Beschaftigungen: Das Falten' by Marie Muller-Wunderlich, which was published by Friedrich Brandstetter in Leipzig in 1900. The salt cellar design appears in Fun with Paperfolding by Murray and Rigney, first published in 1928, as the Salt Cellar, and in Margaret Campbell's Paper Toy Making, first published in 1936, as the Picnic Salt Cellar. Paper Magic by Robert Harbin, published in 1956, contains diagrams for two versions of the design, the classic version under the name Salt Cellar and a second version called the Magic Colour Changer which is manipulated in the same way as the Fortune Teller. In the USA the salt cellar is also known as the Cootie Catcher (although this name is also given to a version of the hexaflexagon, something which can, and does, cause confusion when the two designs are conflated). In his article 'Martin Gardner and Paperfolding', available in the Lister List, David Lister states that Martin Gardner contributed a regular monthly column to Hugard's Magic Monthly between March 1951 and March 1958. These columns were later brought together in book form as the Encyclopedia of Impromptu Magic, published by Magic Inc. of Chicago in 1978. 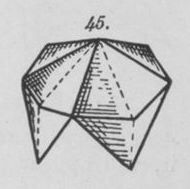 David says that 'the section on Paper Folding, as such, is eight pages long' and that 'The models mentioned or reproduced include ... the Salt Cellar in its various forms of "bug catcher" and "fortune-teller"'. I have not been able to access the text of Hugard's magic monthly but indices available on-line show that there were articles by Martin Gardner on Paper Folding in the issues for Dec 1955 and Jan 1956. This appears to be the earliest known instance of mention of the salt cellar in its fortune teller and cootie catcher guises. Folding Paper Puppets by Shari Lewis and Lillian Oppenheimer, published in 1962, contains a version of the Salt Cellar design which is made into a talking Cat puppet, attributed to Ligia Montoya, by the addition of drawn-on eyes. This is the first instance I can find of the salt cellar being used as a talking toy. 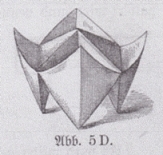 The design also appears as the Salt Cellar in Robert Harbin's follow up book, Secrets of Origami, published in 1963. The same author's Teach Yourself Origami, first published in 1968, and later retitled Origami: The Art of Paperfolding, but commonly known as Origami 1, contains both the basic Salt Cellar and the Colour Changer design from Paper Magic.